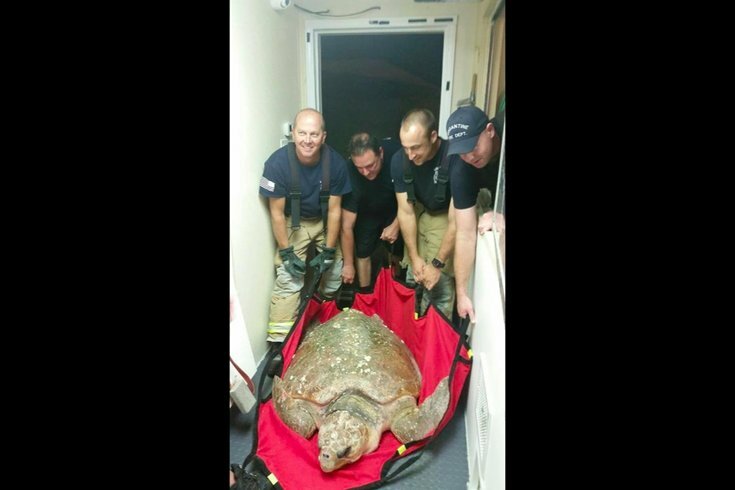 A 279-pound turtle was rescued Sept. 26 in Avalon, New Jersey. A 279-pound sea turtle is on the road to recovery after last month's rescue along the Jersey Shore, but the reptile is eating her rescuers out of house and home. The Marine Mammal Stranding Center provided an update Wednesday on the large loggerhead sea turtle that volunteers affectionately call Esther Williams due to her graceful swimming. The center estimates that she is at least 50 years old. The non-profit organization said that the turtle was checked out by veterinarians after washing ashore on Sept. 26 near 10th Street in Avalon, New Jersey. Esther's bloodwork showed nothing unusual so the staff decided to place her in a large tank to see if she had problems swimming. The turtle swam away smoothly and even made friends with her pool mate, a smaller loggerhead. However, the staff noticed that Esther wasn't eating. She didn't care for the bluepoint crabs in her pool so workers tried different types of food. Eventually, a whelk, which is a kind of sea snail, was dropped in the pool and Esther ate it. The problem is that whelks cost $3.25 a pound and Esther needs between five and nine each day to survive. Due to this issue, the center has exceeded its food budget for the year. Now the center is asking for donations to help contribute to her care and feeding. The plan is for Esther to be sent to North Carolina to continue her rehabilitation. Anyone who wishes to donate can do so here.